Whether you have a gas furnace or an electric furnace keeping you snug and warm this winter season, your heater uses a blower to send hot air out through your ducts. The fan is a crucial mechanical component, and if it should develop problems and cease functioning, then your furnace won’t do you much good. A number of issues can cause problems with the fan, such as a cracked fan belt, a burnt-out blower motor, or the fan sustaining damage. When you think there’s something wrong with your furnace fan, you will need top-quality repair from experts. You’ll get that if you call our Columbus, OH heating repair specialists at Quality Air Heating and Air Conditioning. This is an immediate warning that you will probably notice soon after it starts. This likely indicates that the fan has suffered damage—possibly from debris that got into the cabinet—and its blades are bent. The blades will start striking the casing, making this noise. Turn the furnace off before the blades start to cause more damage, and call in a furnace specialist to either repair the fan blades or replace the unit with a new fan. If your furnace turns on, making its familiar humming sound, but you don’t feel any air coming from the vents—hot or cold—then the furnace fan may have stopped working. There are many reasons for seeing a spike in your power bills that could originate from your furnace. One of them is a malfunctioning fan motor. If the fan and the motor become dirty, they will need to work harder to reach their target temperature. Do not attempt to repair a fan issue on your own; it is not a wise idea to open up a furnace cabinet to perform inspections or attempt fixes if you lack HVAC training. This is especially true for gas furnaces and their carbon monoxide leak danger. The fan is a precision instrument that requires professional attention. 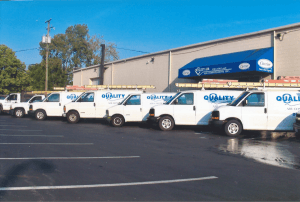 When you need this kind of heating repair in Columbus, OH, contact Quality Air Heating and Air Conditioning. Our technicians are NATE-certified and will get the job done right.